Volterra is a beautiful hilltop town in Tuscany (Italy) that remains a bit off the main tourist trail, which actually is kind of good. Tourists aren’t flocking there, and you can still get that authentic feeling of sunny Tuscany even in the busiest of the summer months. Volterra is for the history geeks and the Italian charm lovers, it is included on the Tentative List of UNESCO World Heritage Sites. This travel guide includes tips on how to get to this small town, which major attractions in Volterra are not to be missed, and other useful information about visiting this beautiful place in Tuscany. We visited Volterra as a day trip during our summer holidays in Tuscany. I haven’t heard of Volterra before going there, but I was surprised to find an absolutely charming town with rich history and a great museum. Read more: Other off-the-beaten track Italy adventures – what to do in tourists-free Padua and a cruise on the Brenta Canal. Are you planning your holidays in Tuscany, then you should read why there are so many towers in San Gimignano and how to spend the perfect day in Florence. DISCLOSURE: This post contains affiliate links. If you purchase one of the products via these links, I may earn a small commission at no extra cost for you. Thus, you are helping me to pay for the hosting of this blog, for example. This is not a sponsored post and I have paid all museum entry tickets and other expenses associated with my visit to Volterra myself. All opinions are mine. 2.1.1 Who were the Etruscan? You’ll need a car if you want to travel around in Tuscany, not that you can’t do that using public transport, but it’s less convenient and you will need to change buses or trains a few times if you want to access Volterra from the major cities in Tuscany. If you still want to try to get by public transport to Volterra (Tuscany), here you can find information about the buses and their timetables. From Florence to Volterra it is only 75 km, from Siena – 55 km, from Lucca – 75 km, Livorno – 75 km, and from Pisa – 70 km. This makes it the perfect place for a day trip wherever you stay in Tuscany. You can also book a day tour from Florence, Siena or Pisa, if you don’t want to visit Volterra on your own. Volterra is a car-free city, so you need to park outside of the city walls. There a few parking places which are well indicated. Depending on from which direction you are coming, there are good signs that will guide you to the nearest parking place. Volterra has rich historical and cultural heritage. It was one of the 12 important cities of the Etruscan League – once powerful civilization that disappeared for good after it was defeated by the Roman Empire. Volterra breathes with the Etruscan culture and traces of the Etruscan period can be found everywhere in the town – from the old city walls to the Etruscan tombs and the Guarnacci Museum. You can download a map of the city from the website of the Tourist Agency in Volterra. Tip: Click on each picture for extra information, fun facts or tips about the place. Did you know that you can share super easily each picture directly on your social media? Just click on the respective SM icon at the right bottom corner of the picture. Three layers of history in Volterra - the Roman Theatre, the Etruscan city walls and the the medieval houses. Tuscany can't get any more authentic than that. There’s so little known about the Etruscan today – a theory suggests that they were indigenous population that had their own language. They had a good contact with Ancient Greece and they brought the Hellenic influence to the Apennines. What we know today about the Etruscan is from what others were saying about them. They called themselves Rasenna or Rasna. The Etruscan civilization emerged somewhere in 800 BC and perished around 250 BC when taken over by the Roman Empire. Fun fact: Did you know that the name of Tuscany (Italian: Toscana) comes from the shortened version in Latin of Etruscus – Truscus, later Tuscus. I have to admit that I was impressed by what I saw there. The museum has an amazing collection of cinerary urns, ceramics, coins and other objects of everyday life. One of the most renowned piece in the collection of the museum is Shadow of the Evening (Ombra della sera) – a bronze votive statuette of an elongated human body, that resembles a shadow of a person cast at sunset. When I saw this figurine I immediately thought of Giacometti and his artwork. Indeed, I read later that Giacometti was inspired by the Etruscan art. Another remarkable object in the museum is the lid of the Urn of the Married Couple (Urna degli sposi), showing an old couple with vivid expressions on their faces, where you can even see the wrinkles. The museum claims to be one of the oldest public museums in Europe, established in 1761. The famous Urn of the Married Couple. They say that the name 'Ombra della sera' (Shadow of the Evening) was given by the Italian poet Gabriele d'Annunzio. The Etruscan Acropolis is a large archaeological site where remains of temples and other religious sites are being uncovered. Quite remarkable is the water system the Etruscan used. As there were no natural water sources on the hill, they would gather the rain water through a system of pipes into large stone cisterns. A part of the old city walls dates back to the time of Etruscan. You can walk now alongside the ancient wall and enjoy amazing views to the landscape of Tuscany. There are 7 city gates and the oldest preserved one is Porta all’Arco. It was part of the defensive structure of the Etruscan, built as early as the 4th century BC. You can clearly see the different types of stones used for the construction of the gate. The other gates date back to the Middle Ages or the Renaissance: Porta a Selci, Porta Marcoli, Porta Docciola, Porta Fiorentina, Porta San Francesco, and Porta San Felice. The irresistible charm of Volterra is present everywhere. Volterra looks as if it's abandoned. Yes - there are tourists, but they just stick to the main squares and attractions. Take a side street and you will find yourself all alone. Somewhere in the 5th century BC began the decline of the Etruscan civilization and by the 3rd century BC all cities of Etruria were taken over by Rome. One of the biggest and best preserved Roman theatres in Italy is the one located in Volterra. The theatre was built in the 1st century BC. It was discovered during excavation works in the 1950s. At one end of the theatre there were found baths built in 4th century AD probably after they stopped using the theatre. The baths are quite interesting as they feature even saunas. The theatre was built in the 1st century BC by the Caecinae family from Volterra. One could access the theatre straight from the city centre via a complex system of stairs. Piazza San Giovanni is the religious heart of Volterra. The Basilica Cathedral of Santa Maria Assunta and the Baptistery are located there. The Cathedral was built around 1120 and the façade dates from 1254. The interior is in Renaissance style from the late 16th century. The Baptistery was built in the 13th century on the place of a pagan shrine. It has an octagonal shape and the façade is executed in white and green marble. The bell tower on Piazza San Giovanni was finished in 1493. The cathedral in Volterra cannot be visited as it is being reconstructed in 2018. The marble columns at the entrance of the Santa Maria Assunta Cathedral are taken from old Roman buildings from the neighbourhood. The facade is attributed to Nicola Pisano. The bell tower in Volterra is exactly the same as the bell tower of the Basilica Santa Christina in Bolsena. Both were built at the same period and probably were designed by Sansovino. The alto-relievo on the wall is of Pope St. Linus (born ca. AD 10 in Volterra, died ca. AD 76 in Rome). Piazza dei Priori is the administrative heart of Volterra with the oldest town hall in Tuscany – Palazzo dei Priori, which dominates the square. Palazzo dei Priori was built between 1208 and 1257. However, the tower got destroyed in an earthquake and was rebuilt in the beginning of the 19th century. Remarkable are the ceramic coat-of-arms on the façade which commemorate the city governors. Palazzo dei Priori functions today as a museum and is open to public. Opening hours: from 14 March to 1 November – daily from 10:30 am till 5:30 pm; from 2 to 30 November – daily from 10:00 am till 4:30 pm, from 1 December to 8 January – daily from 10:00 am till 6:00 pm, and from 9 January to 13 March – daily from 10 am till 4:30 pm. Across Palazzo dei Pretori on Piazza dei Priori is Palazzo Pretorio. It is a complex of several buildings which once were seat of the Captain of the People – an important figure from the period of the Italian city-states. If you look up on the tower next to the Palazzo Pretorio you will notice a small figure of a piglet. The locals call the tower Torre del Porcellino (the Tower of the Piglet). Another palace on Piazza dei Priori is Palazzo Incontri. Unill the end of 19th century it used to be the seat of the Episcopal seminary, today it’s owned by Cassa di Risparmio in Volterra (a local bank). Built in the 12th century, the palace was initially a private property of the Incontri family before it became an Episcopal seminary in the 18th century. You can't really see it clearly on this picture but bunder the torch and flag holders there's engraved on the facade the the very own unit of measurement in Volterra - the "canna volterrana". In the Middle Ages people didn't use the metric system and each City-State had their own units of measurement. Voterra had even two: the first "canne" engraved on Pallazzo Priori has a length of 2.52 m and the second one, engraved on one of the city gates (Porta San Francesco), is 2.36 m.
You can see the small statue of a piglet placed on shelf at the upper end of the tower. One of the most famous tower-houses in Volterra is the Buomparenti tower-house, built in the 13th century. Tower-houses were very popular in the Middle Ages and came to show the importance of their owners – the higher the tower, the more influential and richer was the owner. Speaking of towers and megalomania, San Gimignagno is a fine example of such, with its medieval skyscrapers. Fun fact: If you are a fan (I am not…) of the Twilight Saga, you should probably know that Volterra is the home town of the Volteri vampires clan from the New Moon book. What you most probably don’t know is that Volterra does not appear in the movie. The scenes were shot actually in Montepulciano. The Buomparenti tower-house with its mullioned windows, located at one end of Piazza dei Priori. This should be probably the tiniest house in Volterra. 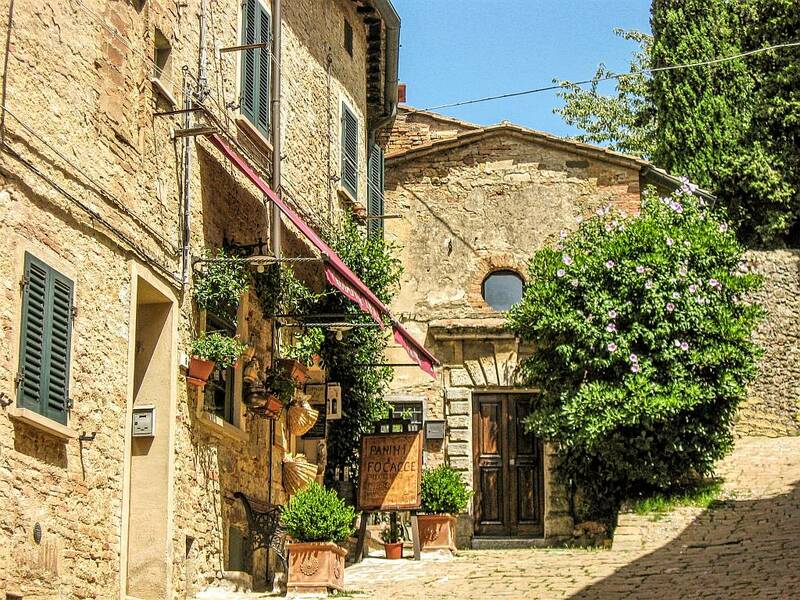 Isn't Volterra simply magical? Other interesting churches to visit in Volterra are the Church of San Francesco, the Church of Santi Giusto e Clemente, and the Church of San Pietro in Selci. San Pietro in Selci was built in 1005 but the facade dates back to few centuries later from the Baroque period. The Church of Santi Giusto e Clemente or San Giusto, as they call it, is located outside of the city walls of Volterra on a hill, surrounded by a sea of green. The work on the church began in 1628 but it was finished only in 1775. Museum of Sacred Art, located at the Church of San Agostino. It is currently closed for visitors. Art Gallery and Civic Museum (Pinacoteca), housed in Palazzo Minucci-Solaini. Ecomuseum of Alabaster, housed in Palazzo Minucci-Solaini. Volterra has a long tradition of extracting and reworking alabaster. The Etruscan has mastered this craft and some fine examples of alabaster urns can be seen in the Guarnacci Museum. Today, you can buy lovely objects of art or souvenirs made of alabaster. Tip: If you are staying longer in Volterra and want to visit more than 2 museums, then I would recommend you the Volterra Card. It’s valid for 72 hours and gives access to the following museums: Guarnacci Etruscan Museum, Pinacoteca, Alabaster Ecomuseum, Palazzo dei Priori, Acropolis and Roman Theater. Fee – 16 EUR, reduced – 13 EUR, families – 24 EUR. It’s hard to miss the Medici Fortress when in Volterra, as it’s dominating the landscape. Actually, the first fortress was built on this place long before the Medici came into power. Rocca Antica (Old Fortress) was built in 1343 by the Duke of Athens right next to one of the city gates Porta Selci. In 1472 began the construction of Rocca Nuova (New Fortress). It’s a very impressive building that was used first as a defense structure and later as a political prison. Since 1816 it is an official prison that is still functioning today. website of the tourist agency in Volterra with more information. The imposing Torre Mastio, built by Lorenzo the Magnificent to show off the dominion of Florence over Volterra. If you decide to spend a few days in Volterra, you can find lovely accommodations: from hotels with authentic look-and-feel to cute bed-and-breakfasts in old farm houses (agriturismi). Why not even use Volterra as a base for your Tuscan holiday? During our Tuscan holiday we’ve stayed in another gem of town – San Gimignano, but Volterra could have been just as perfect, as it is centrally located to all highlights in Tuscany. Have you been to Volterra? Tell us what your impressions are! Or maybe you are going to Volterra and have some questions? I’ll be happy to hear from you. The towers of San Gimignano – medieval frenzy or architectural genius? This is quite the guide! I’ve never heard of it, but love visiting less-known spots – especially in Italy!